Principle of Working-Heavy duty, durable motor and balancing weight at top & bottom, these features are the heart of the vibro screen. 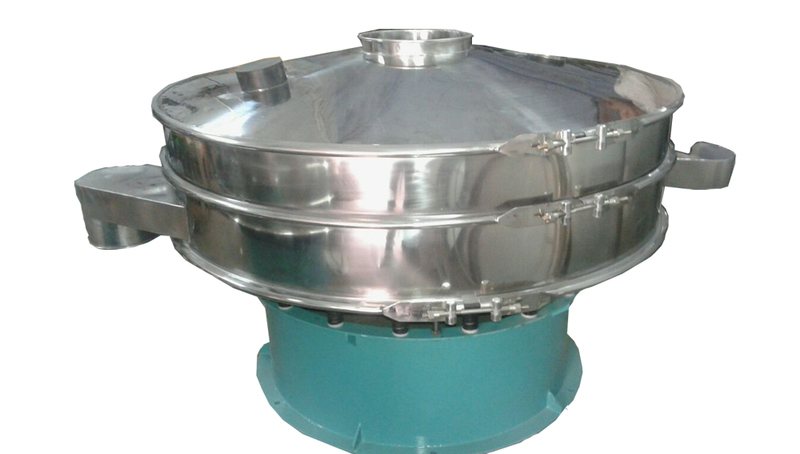 The most effective method for vibrational screening is gyratory vibration which is utilized by the vibro screen. It causes dispersion stirring and rotary motion along with stratification of product to be sifted. On the surface of vibro screen machine, the feed material continuously flows in a horizontal motion. • Good Capacity- Vibro screen provides good capacity per meter square of screening area. When compared to other screening machines, in vibro screen oversize material is discharged with relatively less percentage of fines. • Minimum Blinding- Multi plane action of vibro screen limits screen blinding to minimum limit. However, we can offer anti blinding accessories for blinding elimination for material having inherent characteristics of blinding. • Maximum Screen Life- On specially design mesh frame, we put screen cloth in uniform tension. That screen surface vibrates rigidly without flexing wires and reducing screen wear. So we can get maximum screen life. • No Flooring Foundation- Our machine not requires any special flooring foundation. It can be placed anywhere like wooden floors, on the top of bins or light structures. • Minimum Space- Our vibro screen machine requires less space than any other screening machine. Our Compact machine can fit into any existing production lines. Our Vibro screen machines find application in many industries. Some of them are given below.